In an earlier post I showed four different types of social capital applications. But this can be simplified to include only two (the columns in the previous matrix). These two are: Inward focused, and Outward expanding. This inward/outward dichotomy is of course a fundamental principle of energy exchange: Breathing In, breathing out; Listening, Speaking; Learning, Teaching; Receiving, Giving. The Inward Focused applications of Social Capital are used to first locate needed intelligence, introductions, and influence, and then use the social capital connections to draw those inward (to the person or group that needs them) and focus them on a specific task/need at hand. The Outward Expanding applications of Social Capital are used to spread a vision, mission, message, opportunity, or desired action, out from the center (a person or group) out to the edges of the network. Currently, both of these social capital applications are in use – e.g., LinkedIn more for the inward-focused applications, Facebook (and what else especially?) more for the outward. In a kind of combination effect, outward-oriented campaigns are often used to draw donations, new members, customers, and sometimes ideas back into the organization. Still, the tools themselves are the Outward, mass-campaign type, rather than more precisely-focused Inward type. At least a few months ago it seemed that most of the excitement among organizations and consultants was on how organizations and causes can use the Outward, campaign-focused, applications. Is this still the case? It is probably changing. But still interesting to think about why this has been the case. Social Capital is based on ties of personal trust and affinity, and also on ties of affinity based on mutual goals and values that can exist without needing direct personal connections. These are soulful connections, in contrast to those forged by more purely transactional and contractual ties, which are mechanical, not soulful. Organizations are social capital amplifiers. 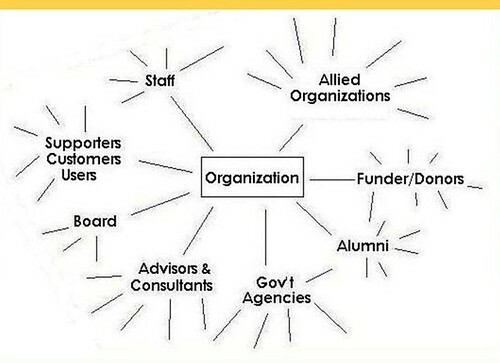 They collect social capital from the networks of all of their employees, funding sources, board members, partners, advisors, volunteers, donors, consumers, and suppliers. They can then focus social capital on a tightly integrated array of crucial projects that in turn affect the success of the whole organization. Social capital networks also enable collecting and focusing social capital to accomplish precise tasks of a single team or a single professional working for the organization. This is collecting power from the edges to accomplish work needed in the center. On the one hand, social media campaigns are becoming well used and understood. (For example, see Momentum: Igniting Social Change in a Connected Age.” On the other hand, using extended social capital networks to get work done within the center of organizations is less well understood and adopted – except by a relative few “networkers” in the organization. Likewise, the tools that can enhance extended social capital applications are far too under-used, largely because of lack of knowledge and focus on why or how to use them. As a result, this means that organizations can currently tap only a tiny fraction of their available social capital. Types of Social Capital, originally uploaded by DuncanWork. 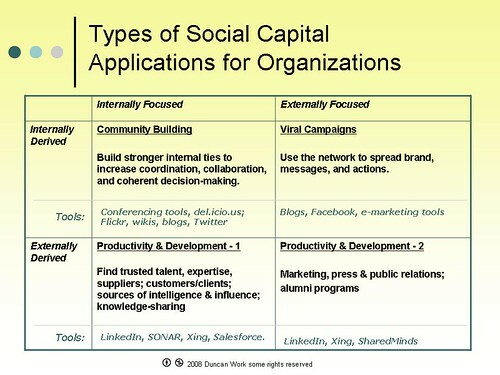 The chart above shows four types of social capital that organizations can make use of. The four types are based on whether the social capital is collected and applied internally or externally, or in combination. The chart also includes a partial list of different social media (“tools”) that can be used to enhance application of social capital in these four arenas. “Externally derived” (or collected) means that the social capital is coming from trusted, reciprocal relationships that are outside of the organization; and “internally derived” means that the social capital comes from relationships that are inside the core organization. Also, note that here I’m using the term “social capital” to refer to the help that people give each other freely (not based on contracts or financial exchanges) because of trusted personal relationships, shared values, affinity. Sometimes the term is also used to refer to financial capital that is invested based on social reasons rather than pure financial returns. How useful is this way of looking at social capital? My next post will also say more about this, and my earlier post on the different strengths of Facebook and LinkedIn also touches on this.